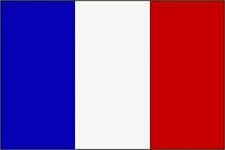 The servicemen of the French troops who fought on the Allied side in the World War II used both domestic and foreign-made boots. In addition to the extensive use of army boots models 1917, 1919 and 1941, different foreign boots were also wide-spread, for example, British "Ankle boots" of black grained leather with reinforced toe and heels, featuring seven pairs of round eyelets for textile laces. The out-soles of these boots were made of very thick leather (about 2.5 inches), padded with 13-15 large boot nails and four nails with metal tips on the heels. Each size boots had three variants of width. It was a very strong and reliable boots, capable to withstand extremely harsh conditions of the North African desert. 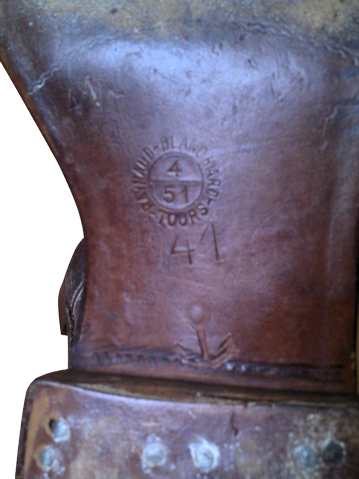 After the Allied landings on November 8, 1942 in North Africa, the French Marines were equipped with the American boots model US17, reddish-brown, made of smooth calf leather. Their main difference from the British boot, except small details (such as the number lacing eyelets or peculiarities of stitching) consisted of a layered structure of the out-soles, and the addition of synthetic rubber tread. The out-soles were attached to the top of the boots by the "Goodyear" welt construction method, and the out-soles were additionally padded with small brass studs with flat heads. 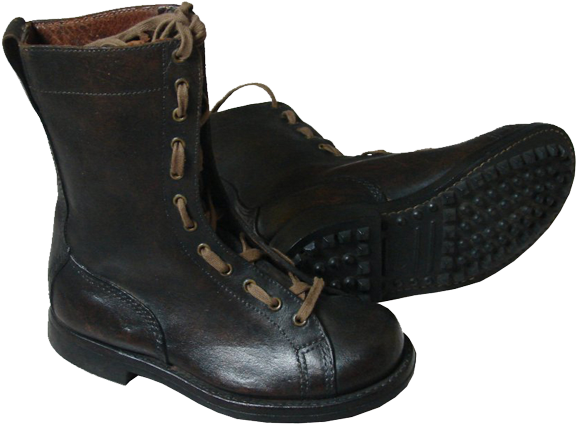 These boots were used in Italy in the years 1943 and 1944, usually with army model M30 khaki-coloured canvas gaiters. In general after the year 1942 the French paratroopers, as well as their British colleagues, already wore American paratrooper's boots. 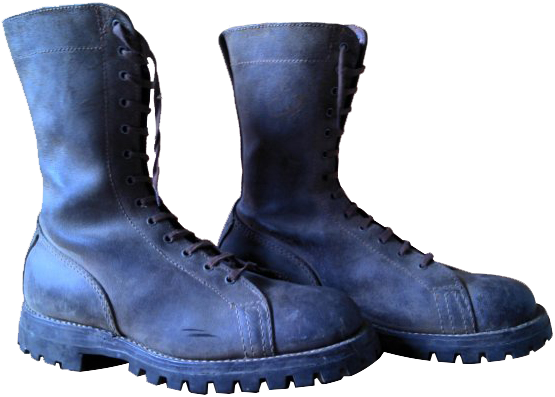 The French paratrooper boots model 1950 (Bottes de saut Mle 50), as the name implies, were used by paratroopers, and they are fundamentally different from the boot model Mle 52 by the design of the top: they had no straps with buckles but featured shallow and low lacing (to select the most appropriate lacing scheme that made it possible to fit the boot's width comfortably), as in the modern Italian paratroopers boots Scarpe militari: "Anfibi" da para. At this the design of the counter of the French Mle 50 boot is exactly the same as on the Mle 52 boots, with two layers lining of the stitched leather. 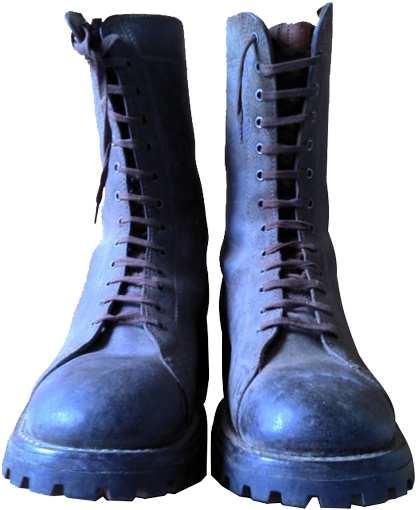 The lacing system consists of thirteen pairs of round eyelets (the modern Italian paratrooper's boots (Scarpe militari: "Anfibi" da para), for comparison, featured 14 pairs of eyelets). 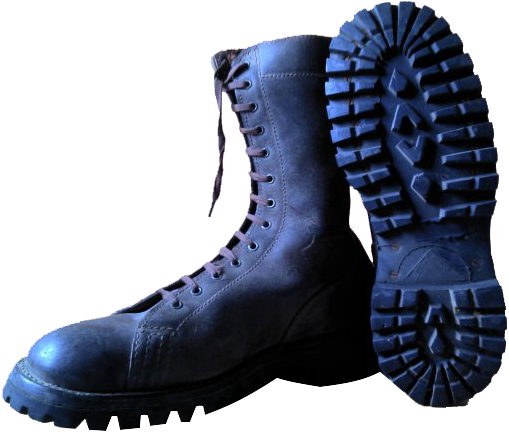 The out-sole tread patterns can be very different - from the out-soles with dotted tread pattern (imitation of nail-padding) to the standard tread pattern, as in the conventional army boots of France (Fig. 27-28). 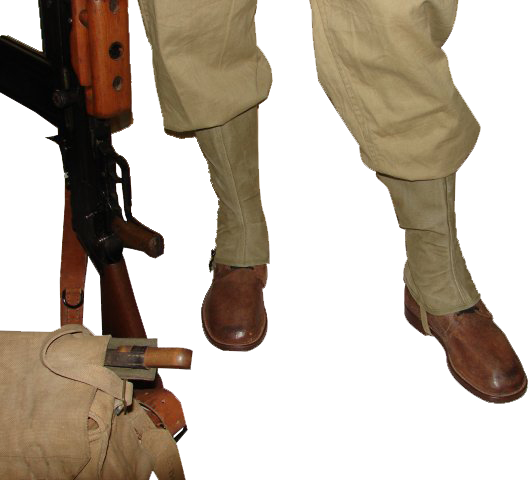 The French parachute boots (Bottes de saut Mle 50) of model 1950, as well as the rare original US model M43 boots from old stock, have been issued to the paratroopers involved in the war in Indochina, as evidenced by the witnesses at the French thematic forums (Fig. 29-30).